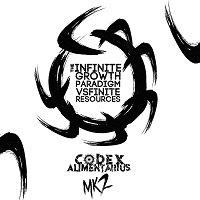 CODEX ALIMENTARIUS formed in 2009 in Exeter, UK, originally as a four-piece act. Their debut was released in 2010 and then there were some tours and line-up changes. The EP here is essentially a re-release of this debut, with the addition of two bonus tracks. “Baptised” comes at your hard and with fanciful melodies from the stars. The vocals are fierce in the Death Metal style. The guitar harmonies are reminiscent of IRON MAIDEN, while the phrasing and chord patterns remind me of INSOMNIUM and WINTERSUN at times. The rhythm is noteworthy as well, like the galloping thunder of a war horse through an army of opponents as the rider mercilessly slays everyone in his path with his rapier. It’s a very vigorous track that will excite you as much as it will pummel you. “Collapse” is a little shorter and opens with a dual guitar attack and a quickened pace. It is absolutely unrelenting in scope; deep, dark and heavy. The melody is dialed back a bit in favor of straight up brutality. “Goodslaves” is a three-minute burner, featuring twin guitar harmonies and an ominous, regal sound, like you are witnessing the erection of a massive monument in the times of ancient Egypt. “No Return” opens with a heaping dose of harmony in a familiar chord pattern that I just cannot place. The rousing rhythm of the drums is an uncompromising display of meter and technique. It’s very anthemic in nature. “Symbiosis” bubbles with melody from guitar parts over top a bed of low and tight instrumentation that varies in key at times. The passages connect very well into a cohesive track. “Arise” closes the EP. The opening sound is thick with Death vocals and a mid-tempo riff with both long held guitar notes and staccato strikes. It sounds like an Egyptian-tinged march of kings; a processional of sorts to introduce the new leader of the lands. The screaming of the title of the song accentuates this point. If you like your Death Metal with some melody and substance, you need to pick up this EP. It is ardent and fierce but with a lot of character. There is a seasoned sound that comes from a group who really compose and play well as a team, and it is reflected highly in this album.